Our 48 inch Gorilla Post™ Bollards are perfect for installation where pedestrian walkways intersect vehicular roadways, and is a high performance channelizer designed to meet the harsh demands traffic delineation while provide high target value. This 4 inch diameter unit temporarily folds over upon impact offering excellent delineation across emergency access points to campuses and venues, and are more conspicuous than standard delineators and raise driver awareness. The bollard’s patented reactive spring system ensures the post will return to its original position impact after impact, reducing replacement costs. The durable, plastic base permanently attaches to concrete or asphalt. This 4 inch diameter bollard has an 8-inch-square base with a 1 inch thickness. Safe for post-tensioned concrete floors. 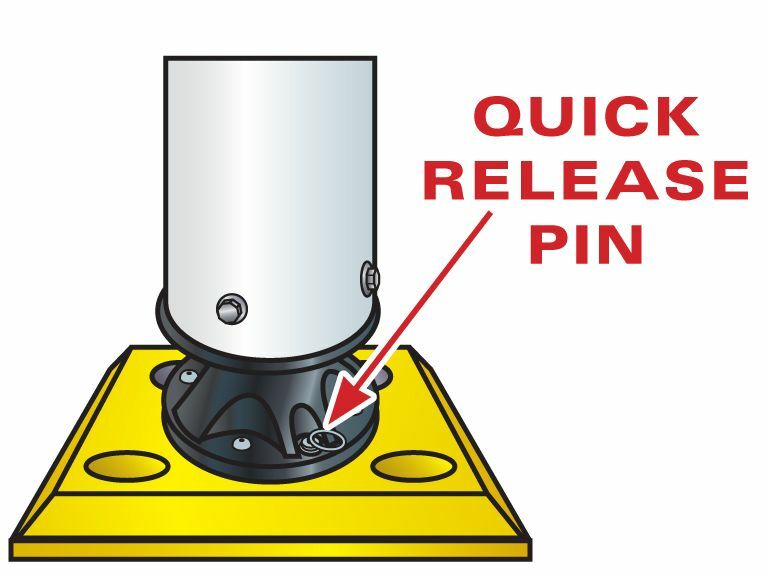 To remove the bollard, pull the spring-loaded pin slightly upwards and twist the bollard leaving the base in place.